RE: trip to New York City: Due to illness there are 2 seats available on our to New York City. More information below & on our web page, www.b-jaytravel.com or call Carolyn, 618-928-3282 as soon as possible. Trip departs NEXT Thursday. New York City/Statue of Liberty, Thurs.-Wed., April 25 - May 1, $815 double occupancy, 10 meals, 7 days. We will have two guided tours of New York City, Central Park, Rockefeller Center, Wall Street, 9/11 Memorial, etc. We will also visit Ellis Island & Liberty Island the home of the Statue of Liberty, etc. Fliers available. B-Jay Travelers enjoy "Queen of Bingo"
Much laughter & fun was enjoyed by Ruth Ann Payne, Della Deain, Betty Teague, LaDonne Suddarth, Eva Lane, Mary Smith, Sue Green, Pauline Hixon, Shirley Shelton, Wanda Gish, Ruth Williams, Loretta Gill, Edith Greenwood, Barb Bromm, Becky Pipher, Donna Buerster, Linda Kessler, Tom Vincent, Gwyn Wilson, Vickie Bennett, Claudia Dickirson, Leroy & Frances Mitchell, Diane Johnson, Wayne Eastin, Marcia Gaddis, Linda Schoncheck, Esther Fear, Wanda Lansbery, Carolyn Fasig, & Director Carolyn McDonald. As they were returning they were discussing where the next B-Jay Travel, 618-928-3282, would take them, Garden of the Gods, Rose Parade, or somewhere else. NEW DATE, Grafton River Adventures, Grafton, IL, Mon. July 22, $127. July 15th date is FULL. S-o-o-o we will go again on July 22nd. SAME TRIP/SAME PRICE. Trip includes transportation, cruise, buffet lunch, & driver’s tip. We will travel to Grafton, board the Grafton River Adventures Boat, cruising on the IL/MS Rivers. As we are cruising, we will enjoy a wonderful buffet lunch; salad, Chicken breast, Cavatelli Pasta, white cream sauce, bread pudding, etc. When we return to the dock we will go to Eckert's Orchard; there we will have the option of picking your own blackberries or peaches or purchasing some that have already been picked. NEW, Branson, MO, Mon., Nov. 11 - Thurs. Nov. 14, $655, double, $770, single. Click on Branson on the left of this screen. Thanks. Rose Parade/Coastal California, Sun. Dec. 29, 2019 - Tues. Jan. 7, 2020, 10 days, $2,578, includes flight, visit Los Angeles, Pasadena, Santa Barbara, Monterey, San Francisco, etc. Making your 1st deposit soon, assures you a seat. Click on Rose Parade on the left of this screen for the daily itinerary. Fliers available. Call Carolyn, 618-928-3282. WOWOWOW, I'm calling Carolyn, 618-928-3282, have her put me on the passenger list ... I want to go to on some of these trips. 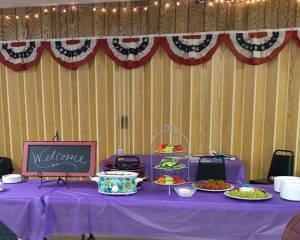 B-Jay Travel (618-928-3282) presented all of the trips that are scheduled for 2019 at the VFW in Olney recently. The attendance was wonderful. Fliers were available for all of the 7-9 days trips for 2019; New York City/Statue of Liberty; Washington DC, Mt. Vernon, Gettysburg; Garden of the Gods, the Royal Gorge, Colorado Springs;  Niagara Falls, Ontario, Canada; & Savannah, Jekyll Island, Beaufort, & Charleston were available. After Director Carolyn had reviewed  all of those trips, the passengers were informed of the day trips & explained that 1 had been added on, Shen Yun, Sat. Feb. 9, 2:00, $149, Stifel Theatre, St. Louis. Many prizes/gift certificates, including a $100 gift certificate, were given away & then some delicious refreshments were served. Thank you for traveling with B-Jay Travel. Where will our next B-Jay Travel trip take us???? All trips pick up in Flora, Olney, Lawrenceville, & sometimes at other locations. NOTE: Last minute reservations are some times possible. It is always better to make reservations early, but don't hesitate to call at the last minute. I may have cancellations and can get you on the trip. At our "Presentation of our 2017 Trips" Willie sang for us last year --- and he did again this year!!!! Reservations are available for all of these trips & the others. We are excited that you are visiting B-Jay Travel’s web site. B-Jay Travel is here to provide unique trips for you, your family, & your friends. On this site you'll find information about our trips, see some of the places we are going to or where we have been. We will tell you about all the trips that are available, where we will pick you up, where you will be going, what you will be seeing, and about any specials we are offering. We hope you will find all of the information that you are looking for about B-Jay Travel on this site. I am calling Carolyn, B-Jay Travel, 618-928-3282/618-395-1270 or sending an e-mail, carolyn@b-jaytravel.com right NOW!!!!! I want to KNOW "WHERE " all the B-Jay Travel passengers are going to go to in 2018!!!!!!!!!! !